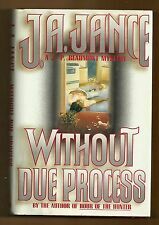 A nice clean, tight, lightly used hard cover copy of "Without Due Process " aJ. P. Beaumont mystery byJ. A. Jance , published by Morrow,first printing of the first edition . J. 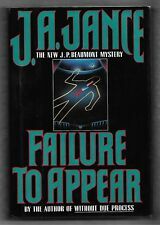 A. Jance's Mystery Thriller "Justice Denied - J. P. Beaumont" was published as hardcover with dust jacket by Morrow c2007 (978-0-06-054092-0). Book is a stated 1st Edition, 1st Printing, in Like New condition: no obvious faults or issues. FIRE AND ICE by J.A. Jance, signed 1st edition/1st printing 2009 William Morrow. J. A. Jance's Mystery Thriller "Rattlesnake Crossing - a Joanna Brady mystery" was published as hardcover with dust jacket by Avon Books c1998 (0-380-97499-1). Book is 4th Printing in Like New condition: no obvious faults or issues. J.A. Jance. SIGNED by J.A. Jance on the Title Page. I have lots of books by J.A. Jance. st Edition, 1st Printing. Book Condition: Near Fine. A First Edition, First Printing. Boards Are Clean - Not Bumped, Interior Is Clean and Legible and Not Remaindered. J. A. Jance's Mystery Thriller "Deadly Stakes" was published as hardcover with dust jacket by Touchstone c2013 (978-1-4516-2868-5). Book is a 1st Edition, 1st Printing, in Like New condition: no obvious faults or issues. J.A. Jance. SIGNED by J.A. Jance on the Title Page. I have lots of books by J.A. Jance and other authors. Fire and Ice. Dust Jacket Condition: Near Fine. Not Chipped Or Crinkled and Not Price Clipped. J.A. Jance. SIGNED by J.A. Jance on the Title Page. I have lots of books by J.A. Jance. Moving Target. st Edition, 1st Printing. Book Condition: Near Fine. A First Edition, First Printing. Boards Are Clean - Not Bumped, Interior Is Clean and Legible and Not Remaindered. SKELETON CANYON by J.A. 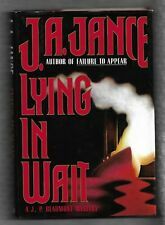 Jance, signed, 1st edition/1st printing August 1997 Avon. Another great book in good condition. J. A. Jance's Mystery Thriller "Trial By Fire - a Sister Anslem mystery" was published as hardcover with dust jacket by Simon & Schuster c2009 (978-1-4165-6380-8). Book is a stated 1st edition, 1st printing in Like New condition: no obvious faults or issues. Book is in absolute perfect condition with no folded or torn pages. Devil's Claw by J.A. Jance. Printing with DJ. J. A. Jance's Mystery Thriller "Dead Wrong" was published as hardcover with dust jacket by Morrow c2006 (978-0-06-054090-6). Book is a stated 1st Edition, 1st Printing, in Like New condition: may have a remainder mark on the bottom page edges, no other obvious faults or issues. Publisher: HarperCollins Publishers Ltd ISBN 13: 9780007194261. Author: J. A. Jance ISBN 10: 0007194269. Books will be free of page markings. Will be clean, not soiled or stained. No. 4 in Alil Reynolds series. First edition, full number line. Unread condition, jacket not clipped. SIGNED BY AUTHOR on title page "Francine, Ali #4, JA Jance.". ALL BOOK JACKETS ARE PROTECTED IN PLASTIC COVERS. This 336 page hardcover book was published by Gallery Books in 2016. Author: J. A. Jance. Tittle: Remains Of Innocence. Condition: Pre-owned. J. A. Jance's Mystery Thriller "Queen of the Night" was published as hardcover with dust jacket by Morrow c2010 (978-0-061239243). Book is a stated 1st Edition, 1st Printing, in Like New condition: remainder marked, no other obvious faults or issues. Author: J. A. Jance. Tittle: Justice Denied - A J. P. Beaumont Novel. By: J. A. Jance. A Joanna Brady Mystery. Dead to Rights. First Edition. A book that does not look new and has been read but is in excellent condition. May have very minimal identifying marks on the inside cover. Author: J. A. Jance. Tittle: Exit Wounds. Condition: Pre-owned. The book is signed on the title page. The book is in very good condition. There are no tears or markings on the book. The pages are clean and the binding is tight. First edition first printing (with 10 9 8 7 6 5 4 3 2 1 count on the publishing page) of the ninth novel in the Alison Reynolds series. SIGNED by the author on the title page. Published in 2014 by Touchstone / Simon & Schuster of New York. Clawback Ali Reynolds Series Book 11 by J. 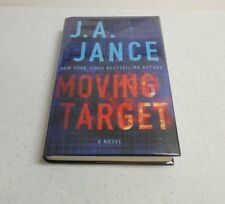 A. Jance Hardcover Hardback New Novel. This is a NEW unread copy in FINE condition. It has been signed by J. A. Jance on the title page. Jance has written "Kirk, Beaumont eleven," andsigned the book on the title page in red marker pen. In search of his runaway teenaged daughter, the sober-but-struggling J.P. finds himself at the Oregon Shakespeare Festival. Author: J. A. Jance. ISBN: 0-688-13824-1 / 978-0-688138240. A List by J.A. Jance (English) Hardcover Book Free Shipping! Born in South Dakota and brought up in Bisbee, Arizona, Jance lives with her husband in Seattle, Washington, and Tucson, Arizona. A List by J.A. Jance. Author J.A. Jance. Years may have passed, but Dr. Edward Gilchrist has not forgotten those responsible for his downfall-certainly not Ali Reynolds, who exposed his dirty deeds to the world. DANCE of the BONES: Book 5 in the J.P. Beaumont series, written by J.A. Dance ~~~'SiGNeD on title page~~~~, mystery, 355 pages. STATED 1st EDITION, Signed on title page. I try to keep my prices competitive. Very good condition. Dust jacket intact. "In the grippingFire and Ice, Jance showcases both Beaumont and Brady.The prolific Jance.is in fine form.". Fire and Ice is not to be missed. --"People". Author J. A. Jance. Their charred remains have been scattered around various dump sites, creating a grisly pattern of death across western Washington. Rattlesnake Crossing by J.A. Jance. Printing with DJ. Author: J. A. Jance. Title:Dead Wrong - Johanna Brady Mysteries. Author: Jance, J.A. First Edition with full number line. Fatal Error: A Novel (Ali Reynolds). Release Date: 2011-02-01. Condition: Collectible: Excellent. Author: Jance, J. A. Dead Wrong (Joanna Brady Mysteries, Book 12). First Edition with full number line. Hill Country Books presents. Release Date: 2006-07-25. Author: J. A. Jance. Stated First Edition, with complete number line, in dust jacket, signed by the author. Nicely signed by the author on the title page. An attractive copy. Date: 2002. Author: J. A. Jance. Betrayal of Trust: A J. P. Beaumont Novel (J. P. Beaumont Mysteries). First edition with full number line. Autographed sticker on dj cover. In protective mylar cover. Release Date: 2011-07-05. We are located in the heart of the Verde Valley Cottonwood, Arizona. Skeleton Canyon by J.A. Jance. Printing with DJ. J.A. Jance Novels Hard Covers with Dust Jackets and plastic dust jacket protectors. 7 of the books are gift inscribed to "Alice" by author. One has previous owners book plate on inside cover. the other are flat signed by the author on title page. Author: Jance, J. A. 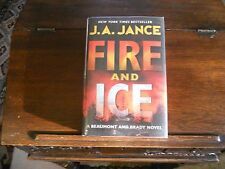 Fire and Ice: A Beaumont and Brady Novel (J. P. Beaumont Novel). First Edition with full number line. Release Date: 2009-07-21. Have you ever bought a book and not recieved the book in the picture?. We always take pictures of the exact item for sale so you know what you're getting. We are so happy and grateful for your decision to buy from us!